Anglim’s Western Metal Work is a full-service welding and fabrication shop. That means we do more than assemble new metalworking projects – we are also available for maintenance and repairs. Whether you need help with an installation of prefab components made in our shop or require emergency welding service for your commercial machinery, we’re here to help. Our team has decades of combined experience in welding and metal fabrication. Our welders are AWS-certified, and we are able to work with a variety of welding techniques, materials, and conditions. Our work can be found in both private and commercial/industrial settings, encompassing everything from metal artwork to structural components. Whether you need welding repair at your construction site or a new component, you can count on us to get the job done with efficiency, precision, and attention to detail. 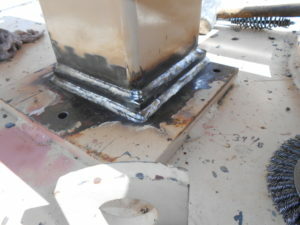 We offer mobile welding service, providing on-site welding repair and field welding service throughout the state. From southern New Mexico’s mining operations to construction sites in Albuquerque and the labs in Los Alamos, we’re available to complete your welding repairs. Contact us today to learn more about our services or schedule welding repair for your home or business. Call 505.822.9170 to schedule repair service today.